Jefferson County is included in the Denver-Aurora-Lakewood, CO Metropolitan Statistical Area. 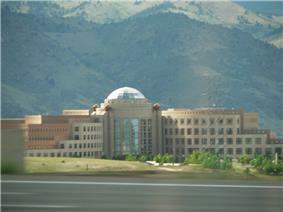 Located along the Front Range of the Rocky Mountains, Jefferson County is adjacent to the state capital of Denver. In 2010, the center of population of Colorado was located in Jefferson County. The county's slogan is the "Gateway to the Rocky Mountains", and it is commonly nicknamed Jeffco. The name Jeffco is incorporated in the name of the Jeffco School District, the Jeffco Business Center Metropolitan District No. 1, and several businesses located in Jefferson County. Jeffco is also incorporated in the unofficial monikers of many Jefferson County agencies. The Rocky Mountain Metropolitan Airport operated by Jefferson County was previously known as the Jeffco Airport. On August 25, 1855, the Kansas Territorial Legislature created Arapahoe County to govern the entire western portion of the territory. The county was named for the Arapaho Nation of Native Americans that lived in the region. In June 22, 1850, Jefferson County. Jefferson County was named for the namesake of the Jefferson Territory, Thomas Jefferson, the principal author of the Declaration of Independence and the nation's third president. Golden City served as the county seat of Jefferson County. Robert Williamson Steele, Governor of the Provisional Government of the Territory of Jefferson from 1859 to 1861, built his home in the county at Mount Vernon and later at Apex. The Jefferson Territory never received federal sanction, but during his last week in office, Park County, reducing Jefferson County to its present length of 54 miles (87 km). Several annexations by the City & County of Denver and the 2001 consolidation of the City & County of Broomfield removed the east and extreme northwestern portion of the county, respectively. According to the U.S. Census Bureau, the county has a total area of 774 square miles (2,000 km2), of which 764 square miles (1,980 km2) is land and 9.8 square miles (25 km2) (1.3%) is water. Jefferson County is one of the few counties in the United States to border as many as ten counties. As of the census of 2000, there were 527,056 people, 206,067 households, and 140,537 families residing in the county. The population density was 683 people per square mile (264/km²). There were 212,488 housing units at an average density of 275 per square mile (106/km²). The racial makeup of the county was 90.59% White, 0.89% Black or African American, 0.75% Native American, 2.28% Asian, 0.08% Pacific Islander, 3.23% from other races, and 2.18% from two or more races. 9.95% of the population were Hispanic or Latino of any race. There were 206,067 households out of which 33.40% had children under the age of 18 living with them, 55.10% were married couples living together, 9.10% had a female householder with no husband present, and 31.80% were non-families. 24.50% of all households were made up of individuals and 6.30% had someone living alone who was 65 years of age or older. The average household size was 2.52 and the average family size was 3.03. In the county the population was spread out with 25.30% under the age of 18, 8.10% from 18 to 24, 32.10% from 25 to 44, 24.90% from 45 to 64, and 9.60% who were 65 years of age or older. The median age was 37 years. For every 100 females there were 99.00 males. For every 100 females age 18 and over, there were 96.80 males. The median income for a household in the county was $57,339, and the median income for a family was $67,310. Males had a median income of $45,306 versus $32,372 for females. The per capita income for the county was $28,066. About 3.40% of families and 5.20% of the population were below the poverty line, including 5.80% of those under age 18 and 5.10% of those age 65 or over. Jefferson County School District R-1. The Federal Correctional Institution, Englewood is in unincorporated Jefferson County. The Rocky Flats Plant produced nuclear weapons in Jefferson County from 1952 until 1989. The Jefferson County Public Library, established in 1952. ^ "Centers of Population by State: 2010". United States Census Bureau. Retrieved June 8, 2014. ^ "FCI Englewood Contact Information." Federal Bureau of Prisons. Retrieved on July 28, 2010.